A simple vodka cranberry cocktail perfectly balanced to quench your thirst for a sweet, yet tart beverage. Vodka blended with a simple syrup, cranberry juice and a touch of lime is all you need. If you live in the United States, then Thanksgiving is this Thursday. Let’s face it, after all that cooking and hard work, you’re going to need drink. 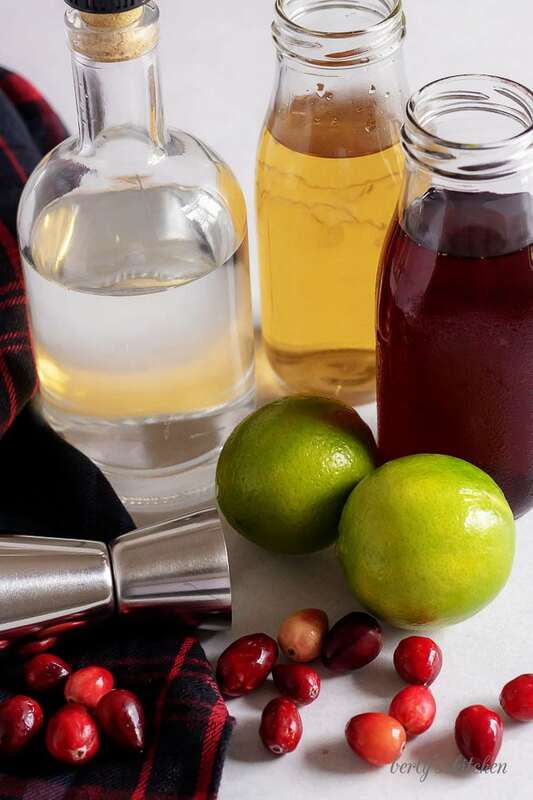 Why not mix up a cocktail that celebrates the festive season? 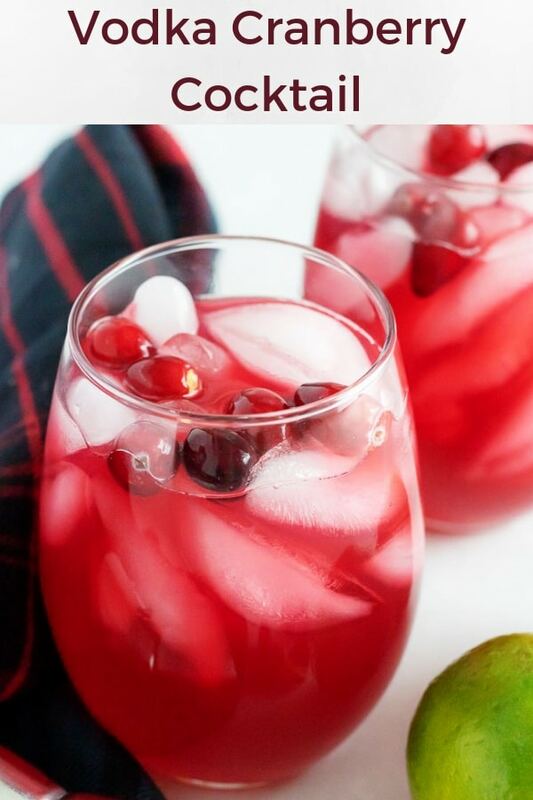 Cranberries are still in season and make the perfect garnish for this vodka cranberry cocktail. This recipe creates a tart drink, so if you like your adult beverages a little on the sweet side, then I recommend increasing the amount of simple syrup. Now that my little disclaimer has been made we can get down to business. This easy cocktail only has four ingredients and can be mixed in a matter of seconds. Best of all, I added a little shortcut to making a rustic simple syrup. The hardest part of the recipe is juicing the lime. 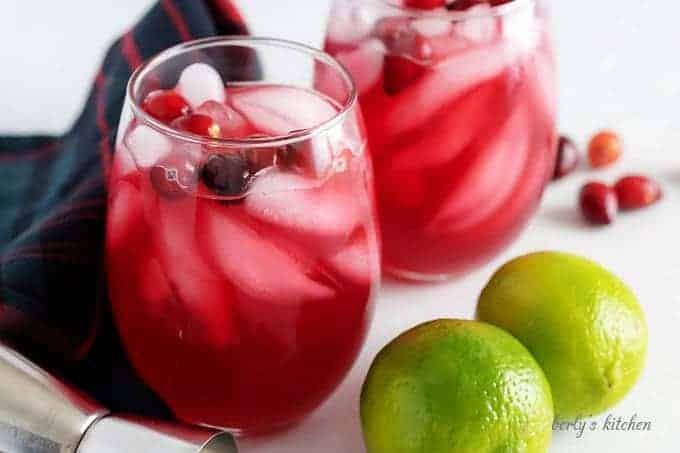 A word of caution on the lime juice, please try to use fresh because the concentrated stuff can overpower the sweetness of the cranberries and the syrup. Now that I’ve gotten all my recommendations out of the way, how about we stop chatting and make a vodka cranberry? First, in a sealed container combine the powdered sugar and hot tap water. This isn’t the traditional way, but hey, it works. Last, seal the container and shake it vigorously. The hot water should dissolve the powdered sugar. Alternately, you can heat the water on your stove in a small saucepan and stir in the sugar as it begins to steam. First, juice the lime or use store bought lime juice. However, the store bought stuff is a concentrate so use just a dash of it in place of the fresh stuff. Next, add ice to your shaker. You’ll only want to put a few cubes in their to chill the drink as it mixes. Also, go ahead and fill your glass about half-full of ice. Then, pour the cranberry juice, vodka, simple syrup, and lime juice into your shaker and seal the lid. Last, shake the cocktail shaker to mix the ingredients. 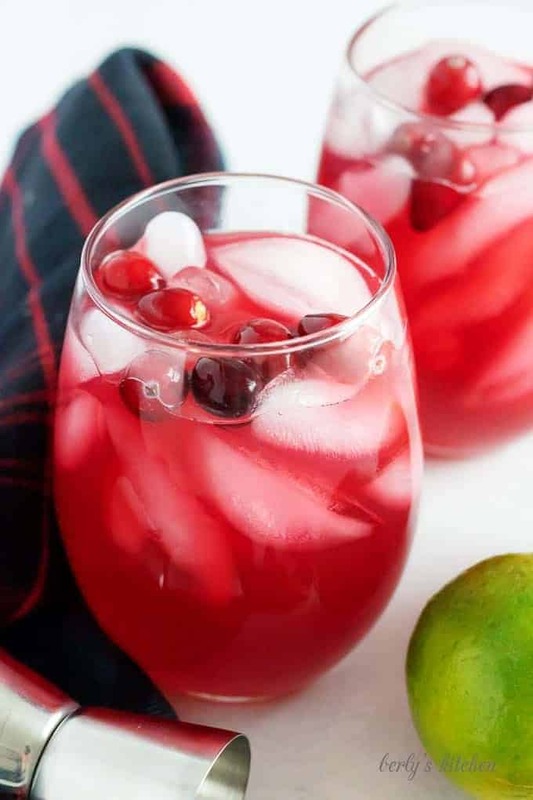 Once your tart drink is mixed, pour the vodka cranberry cocktail into a 6-ounce cocktail glass and serve. You can add about .5-ounce of Triple-Sec to the drink or use a citrus flavored vodka to create another layer of flavor. 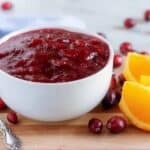 For a sugar-free alternative, try using sugar-free cranberry juice and agave nectar or Stevia in place of the simple syrup. If you don’t have a shaker cup(s), no worries, simply start with a glass with ice in it then layer the following ingredients in this order; cranberry juice, lime juice, simple syrup, and vodka. Use a spoon and give the cocktail a quick stir. It’s not exactly the same, but it works nonetheless. Looking for a drink with a bit more kick? Try our Maple Old Fashioned. For more seasonal cocktails then try our Spiked Pumpkin Hot Chocolate or our Coquito recipe! In a sealable container, combine water and powdered sugar. Whisk or seal container and shake, until sugar has dissolved and set aside. First, juice a half of medium lime and set aside. Next, in a cocktail shaker combine cranberry juice, vodka, simple syrup and lime juice. Then, shake the mixer vigorously for approximately ten seconds. 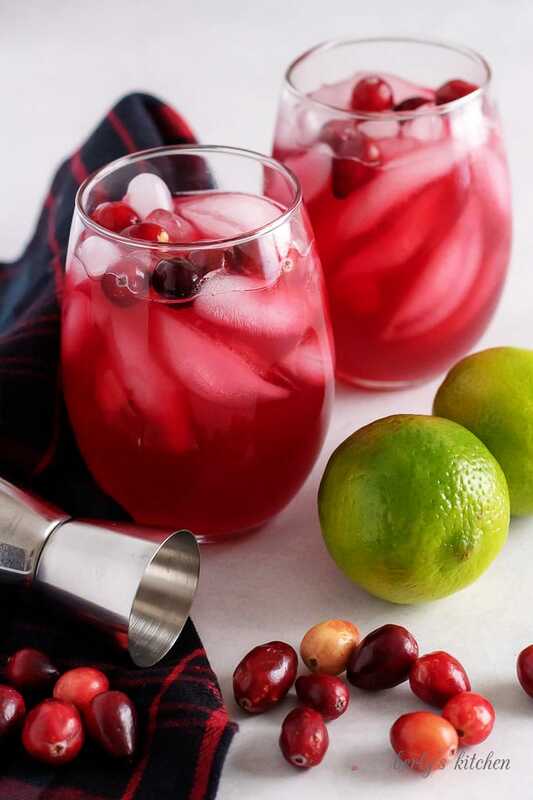 Last, pour the drink into a 6-ounce glass and garnish it with a lime wedge or fresh cranberries. Hot water from your kitchen water spigot should be warm enough to dissolve the powdered sugar in the simple syrup. The calories listed are an approximation based on the ingredients and a serving size of one cocktail. Actual calories may vary. They are definitely two of the best flavor combinations for drinks! Thanks, Breyona! Looks like a beautiful beverage! This looks really good! You had me at vodka! Thank you. I agree, Belle!! Lol! Looks good, and perfect for the holidays! Thank you, Nicole! It’s a fun little drink and I love the tartness of the cranberries. 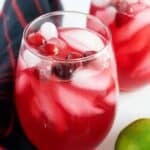 I love this little twist on a regular vodka cran. Yum! Thank you, Chelsea! The lime adds just a touch of fresh “zing” to the drink. If you make one, let us know what you think. This looks so good! I will definitely be trying this recipe soon! Thank you, Mytha! I hope you enjoy it. We think it’s perfect for the holidays! Thanks for the comment, Marlynn. Vodka Cranberry was one of my go-to drinks in college, when I had the same goal you did. This sounds like a much better version! Thanks lol! It wasn’t until I lived in Miami, FL that I began to appreciate using limes in my drinks. What a fun recipe – I can’t wait to give these a try. Thanks, Christine! Hope you enjoy!